We Demand Tunnel Shelters For All! 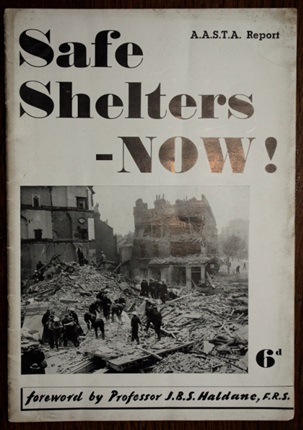 At the outbreak of World War II official government policy was to actively discourage people using Underground stations to shelter, in part fearing people would develop ‘deep shelter mentality’ and refuse to resurface, thus threatening the war effort. However, underground shelter was dangerous, as evidenced through a number of high profile disasters; at Bank on 11 January 1941 a bomb landed in the ticket hall killing over 100 people; and on 12 October 1940 at Trafalgar Square when a bomb exploded at the top of the escalators causing a mud slide which smothered the platforms and killed seven people. On top of this, with no public lavatories and so many people conditions quickly became unsanitary and disease rife. Pressure for deep level shelters persisted and despite reportedly referring to those calling for improvements as “fifth columnists” , on 3 October 1940 in his new role as Home Secretary, Herbert Morrison complied, ordering construction of ten deep level shelters. In autumn 1942, eight deep level shelters were finally completed (the other two were scrapped during planning). Located 100 feet below ground, measuring 100 feet in length and 4.9 meters in diameter, they had a capacity for 8,000 people and provided beds, toilets, water and fresh air via ventilation shafts. They also had heavy concrete blockhouses at the top of the staircases to prevent recurrence of disasters like that at Bank. 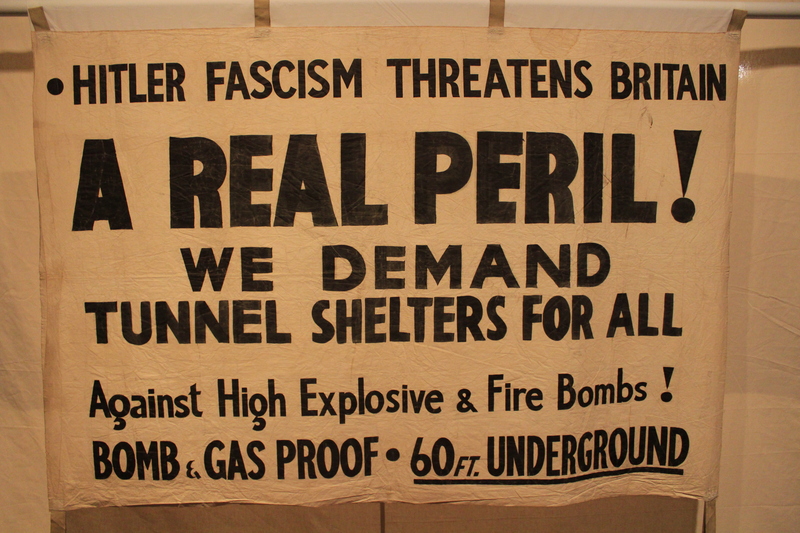 Why, then, was a banner [pictured above] calling for ‘Better Tunnel Shelters for All’ produced in 1942? Because, the government believed that the worst of the Blitz was over and therefore that opening these shelters would not be cost effective. So the shelters remained closed to the public, though some were re-purposed; as the head quarters for General Eisenhower, as a hostel for American troops and for housing British soldiers and government use. Only when V1 and V2 rockets struck London in June 1944 did some of these shelters open, but even then only five of the eight. Post war, the shelters weren’t used to plan either. Initially they were designed to be merged with the existing underground network, creating an express route across London. But this was never born out and other uses were found; Clapham South, for example, served many purposes including accommodating visitors to the 1951 Festival of Britain and the 1953 coronation and serving in 1952 as a billet for troops lining the route for the funeral of George VI. And today? These deep level shelters still exist, mostly in commercial use as data storage facilities. Fourth Report of the A.R.P. Committee of the A.A.S.T.A. Reprinted from ‘Architectural Design & Construction”, May, 1941. This entry was posted in Campaigning, Socialist History, World War II and tagged air raid, air raid shelter, banners, blitz, Communist Party of Great Britain, CPGB, deep level shelters, Herbert Morrison, tunnel shelters, World War II, WWII. Bookmark the permalink.